We know that presently Sun is 4.5 billion years into its main sequence. It has another 5 billion years before it enters the Red Giant phase. We also know that Sun's luminosity increases by 10% every billion years during the main sequence. I am interested in finding the temperature rise as we approach the end of main sequence. I got two different values for temperature on Earth. Wikipedia entry says that temperature on Earth would be 422 k in 2.8 billion years. However, if we use the formula for effective temperature as discussed in this answer https://earthscience.stackexchange.com/a/4274/15299 and L = 1.8 then, the temperature on Earth would be 330K. Also in this book, the author does the same calculations on page 255. Answers will be different because they must be tied to a model of solar evolution, and all models are a bit different. So to answer your question we have to select a model. A pretty standard and trusted one, is the one used in the paper Stellar evolution models for Z = 0.0001 to 0.03. Where Z stands for the metalicity of the star, that for the Sun they indicate would be 0.0188. 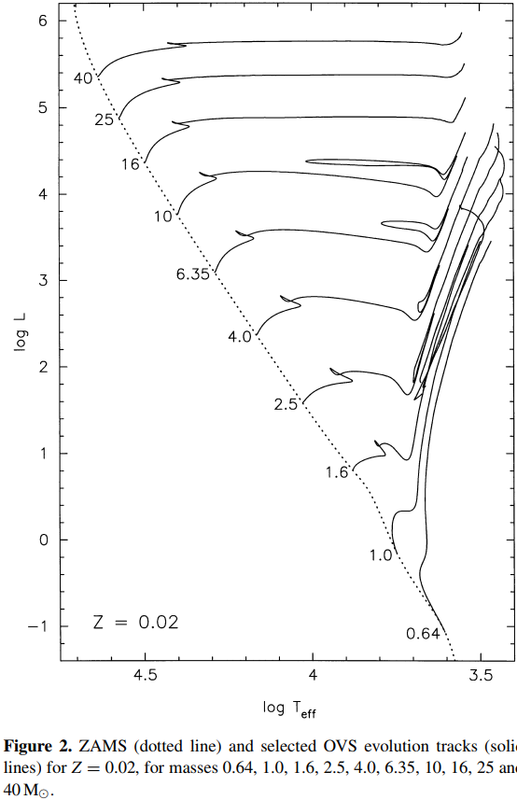 In figure 2, they show the trajectory of a star like the sun in the H-R diagram (look for the line labeled "1.0"). And given that you are interested in specific values here is some tabulated data including also the solar radius. Note that most of these points are linear interpolations of the original data, that had only six points in this age range. Note that you can only know the effective temperature, the actual temperature will depend on the strength of the greenhouse effect, and modeling that is a whole new problem with huge uncertainties. 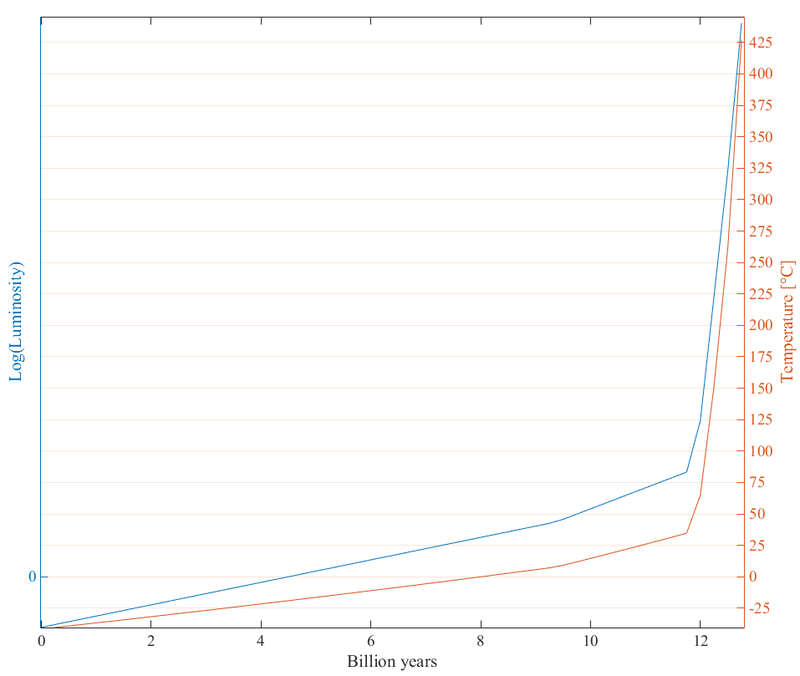 According to this model, the terminal age main sequence of the Sun would be 9.38 Billion years, and according to the data above, the effective temperature then would be 8.2 °C (281 K), that's 27.2 °C hotter than today. Not the answer you're looking for? Browse other questions tagged geophysics hypothetical astronomy energy-balance or ask your own question. What would be the first thing which will render the Earth uninhabitable? Would life on Earth survive without the Sun? What would the equilibrium temperature be at the poles in a world without seasonality? Will the Earth's core cool? How do we calculate if a meteoroid will completely burn up in the atmosphere? Does the Earth 'Flare' like the Sun does?